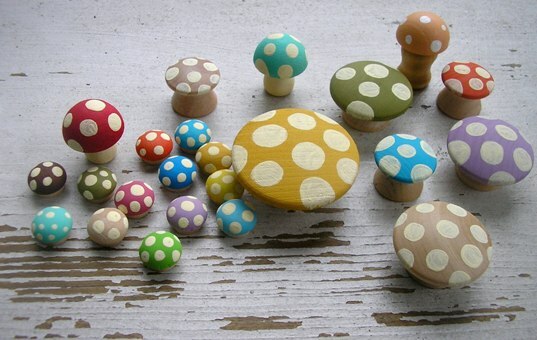 Sweet counting fun – count mushrooms, count their dots, count all the colors you see! Line them up, stack them high, place them on the floor in pretty patterns. Develop hand-eye coordination by placing them in and out of a bowl. Use them as an accessory for small dolls, pretend fairy tale lands, or even in a dollhouse. Art project time! You can order these unpainted so you and your little one can decorate them together. These Waldorf inspired mushrooms are made by the fabulous Wee Wood Natural Toys and come in a wonderful array of magical colors, shapes and sizes. Wee Wood Natural Toys is an eco-friendly, mama-run company. All of Wee Wood Natural Toys‘ products and the materials used in their lovely creations are non-toxic and natural, and they use recycled shipping & packaging materials. 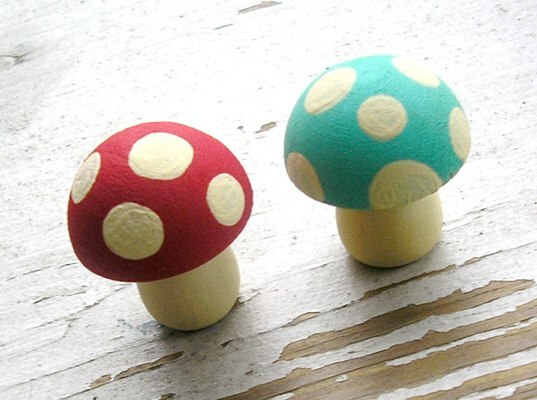 Although the mushrooms are made with non-toxic paint and a non-toxic and hypo-allergenic sealant (safe for little chewers), children under the age of three years should not play with the smaller mushrooms as they could pose a choking hazard. Mushrooms are available in various sets, such as a bulk bag of 25 mushrooms, three mushrooms, five mushrooms, and more. Many of the sets include a muslin drawstring bag.